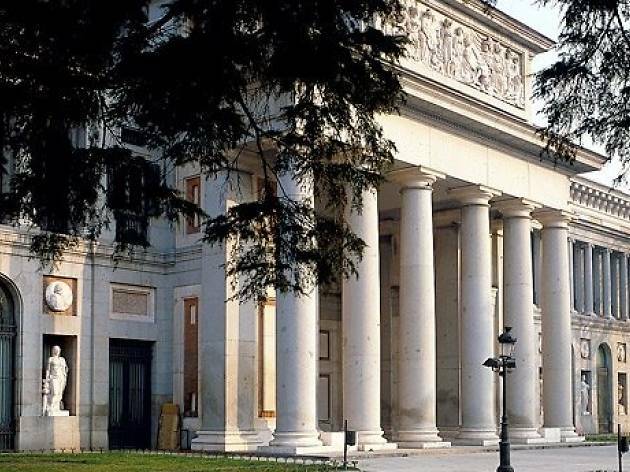 Housed in a gigantic neo-classical building begun by Juan de Villanueva for King Carlos III in 1785, the Prado is Madrid's best-known attraction. 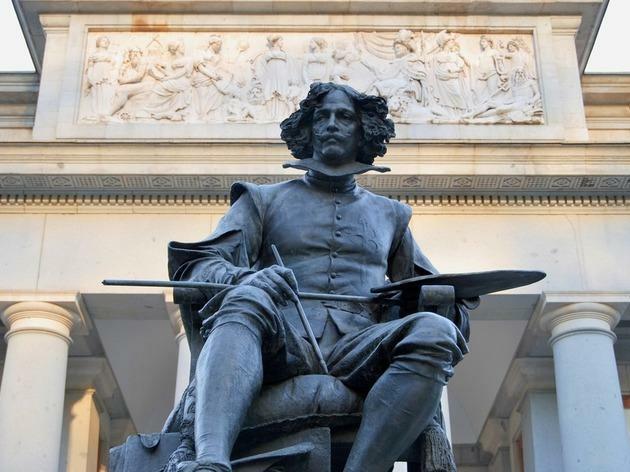 Carlos originally wanted to establish a museum of natural sciences, reflecting one of his chief interests, but by the time it opened in 1819, this plan had changed: the Prado was a public art museum – one of the world's first – displaying the royal art collection. Spain's 'non-king', José Bonaparte, had first proposed the idea and it was taken up by the restored King Fernando VII (grandson of Carlos III), who took on board the demands of the Real Academia de Bellas Artes and those of his second wife, María Isabel de Braganza, considered the museum's true founder. 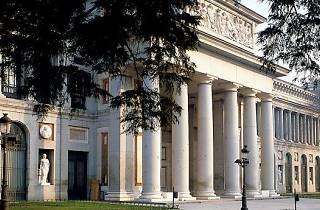 In recent years the Prado has undergone a highly ambitious expansion programme, including the remodelling of the Casón del Buen Retiro, an annex opposite El Retiro park. Behind the main museum, on the site of the San Jerónimo cloisters, the new and highly controversial cube-shaped edifice designed by Rafael Moneo, which hosts temporary exhibitions, was also unveiled. As for the collection itself, the core is still the royal holdings, so it reflects royal tastes and political alliances from the 15th to the 17th centuries: court painters Diego de Velázquez and Francisco de Goya are well represented. Political ties with France, Italy and the southern, Catholic Netherlands also assure the presence of works by Titian, Rubens and Hieronymous Bosch ('El Bosco'), among others. The collection did have some gaps, mainly owing to Spain's hostilities with England, Holland and other Protestant states, and the Spanish monarchs' unfamiliarity with artists pre-dating the High Renaissance, but recent acquisitions have evened things out somewhat. Spanish monarchs had begun collecting long before, and by the 1500s Queen Isabel already had a substantial collection of works by Flemish artists. During the reigns of Emperor Carlos V (1516-56) and Felipe II (1556-98), Italian and Flemish works continued to dominate. Titian was a favourite of both kings, and the eclectic Felipe II also purchased several works by Bosch, among them the enigmatic, slightly surreal triptych 'Garden of Earthly Delights', which he had hanging on his bedroom wall in El Escorial. The white face beneath a hat in the 'Hell' panel is widely believed to be the artist himself. Felipe IV (1621-65) is seen as the greatest of the Habsburg art collectors, and the leading connoisseur of his day. Flemish influence was still very strong, and the king was a major patron of Rubens. The latter was contemptuous of Spanish painters until he saw the work of the young Velázquez, who would serve Felipe IV as court painter for nearly 40 years (1623-60). Velázquez also supervised the acquisition of other works for Felipe IV, adding nearly 2,000 paintings by Renaissance and 17th-century masters. Spain's first Borbón King, Felipe V (1700-46), brought with him one of the museum's most extraordinary possessions, displayed in the basement: the 'Tesoro del Delfín' ('Treasures of the Grand Dauphin'). The Dauphin, eldest son of Louis XIV of France and father of Felipe V of Spain, accumulated a massive art collection, part of which was left to Felipe. The 'Treasure' is mostly 16th- and 17th-century Italian objets d'art, such as rock-crystal vases studded with semi-precious stones and with gold and silver trims. The last monarch to add significantly to the royal collection was Carlos IV (1788-1808), the employer of Goya, possibly the least respectful court painter who ever lived (for Goya's portrait of Carlos IV's family. Following Carlos's death, the collection would be supplemented by later purchases and works seized from religious houses following their dissolution in the 1830s. 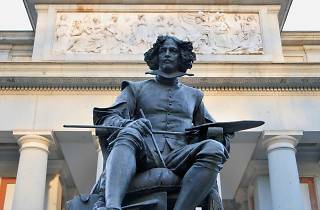 With such a concentration of masterpieces, it is impossible to do the Prado justice in a single visit. The free maps provided at the entrances, available in English, will help guide you to the must-sees. The museum's website also offers some suggested itineraries which will allow you to see the main masterpieces, depending on the how much time you have. The ground floor contains earlier paintings and sculptures: stunning Spanish Romanesque murals and Gothic altarpieces; works from the Italian Renaissance (masterpieces by Botticelli, Titian, Caravaggio and Rafael); 15th-century Flemish paintings, with the world's greatest collection of works by Hieronymus Bosch; plus El Greco, and German paintings such as Dürer's extraordinary 1498 'Self-Portrait'. Also on this floor you'll find the classical and Renaissance sculptures, and the vault that currently houses the 'Tesoro del Delfín', until its eventual transfer to the Palacio del Buen Retiro. Entering via the Puerta Alta de Goya, you reach the first, and what is considered the principal, floor. Here you encounter French and Italian 16th- and 17th-century paintings, with works by Poussin, Claude Lorrain and Artemisia Gentileschi, among others, followed, on the left, by several rooms of Flemish works (Rubens, Breughel, van Dyck). Stretching ahead on the right is a long gallery with Spanish paintings of the same period, featuring Murillo, Ribera and Zurbarán. This leads to one of the Prado's greatest attractions: the Velázquez Rooms. In the great hall in the centre of this floor are Velázquez's massive state portraits of Felipe IV and his court, with their air of melancholic grandeur, and his wonderful 'Surrender of Breda' (known in Spanish as 'Las Lanzas'), which are all due to move to the Palacio del Buen Retiro at some point. Pride of place, though, is taken by 'Las Meninas', often described as the greatest painting in the world, because of its complex interplay of perspectives and realities. Velázquez inserted himself at the left of the painting, supposedly creating a portrait of the king and queen, who appear bizarrely in a 'mirror' at the end of the room, but in whose place stands every viewer, watched forever by Velázquez, the little Infanta Margarita and other figures in the painting. Different but equally impressive are the artist's extraordinary 'Los Borrachos' ('The Drunkards') and the portraits of the royal dwarves. The rooms devoted to Goya are the most numerous dedicated to any one artist in the museum and are on three floors in the southern area of the building. 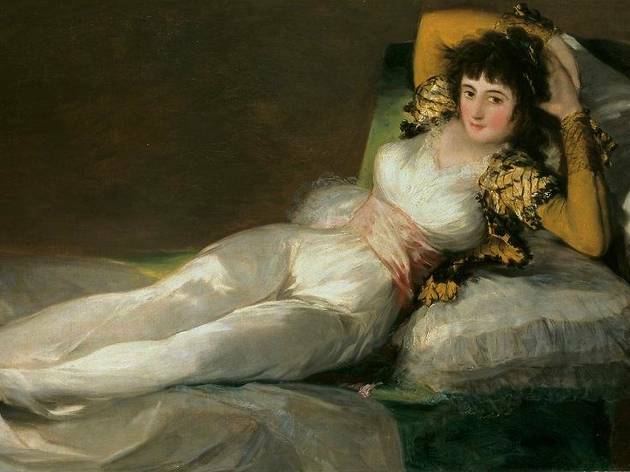 Every stage of his career is superbly represented, from cynical portraits of the aristocracy to the 'Majas', and his portrait 'La Condesa de Chinchón' ('The Countess of Chinchón'). There are also his tremendous images of war, such as the masterpiece 'The Third of May 1808', depicting the executions carried out by French troops in Madrid in that year. 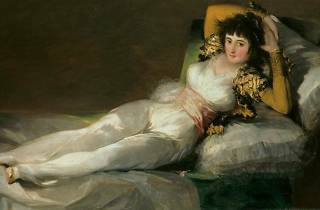 Even more fascinating than these are the 'Pinturas Negras' or 'Black Paintings', the turbulent pictures executed by Goya in his final years. Witchcraft, violence and historical drama combine in an astonishing array of monstrous images, many originally painted on the walls of his home, the Quinta del Sordo, between 1819 and 1823. On the second floor there are his earlier, lighter, portraits and the carefree tapestry cartoons he designed for the royal palaces. Here too are European paintings from the 18th century. A couple of rooms also contain works by the German neo-classical master Mengs, the Italian Tiepolo and the French painter Watteau. One of my favorite museums the world over. Very extensive collection - traverses time, movement and style. Many of the masters are represented here, and the journey through the museum is intuitive and enjoyable. Very accessible to groups, tours are fantastic, and curators are knowledgeable. I have specific favorites like Goya's black paintings. The Prado Museum is great. It houses what is undoubtedly one of the most impressive collections of pre-modern European painting in the world. From Bosch's 'Garden of Earthly Delights' to a whole room dedicated to Goya's Black paintings, the museum proves itself as a carefully curated institution, self-conscious of its importance to the art world. But the museum also houses a very interesting collection of Spanish Realist painting, by lesser known but equally interesting artists. Only downside is the huge queues, over crowded rooms and expensive tickets. But then I guess this happens in institutions of such importance.